Dominant Social Theme: Desperate measures for desperate Greeks? Free-Market Analysis: This article posted by the UK Telegraph deals with the emergence of alternative money in a stressed Greek society. What's an alternative dominant social theme? That people will take action, however ineffective, when they have no other options. A subdominant social theme might be "no gold or silver needed." That's right, the article manages the feat of portraying a society turning to alternative money without ever dwelling on gold or silver ... especially silver. What the article DOES clumsily portray is the emergence of various kinds of alternative monies in lieu of the euro itself. In this bustling port city at the foot of Mount Pelion, in the heart of Greece's most fertile plain, locals have come up with a novel way of dealing with austerity – adopting their own alternative currency, known as the Tem. As the country struggles with its worst crisis in modern times, with Greeks losing up to 40% of their disposable income as a result of policies imposed in exchange for international aid, the system has been a huge success. Organisers say some 1,300 people have signed up to the informal bartering network. For users such as Ioanitou, the currency – a form of community banking monitored exclusively online – is not only an effective antidote to wage cuts and soaring taxes but the "best kind of shopping therapy". "One Tem is the equivalent of one euro. My oil and soap came to 70 Tem and with that I bought oranges, pies, napkins, cleaning products and Christmas decorations," said the mother-of-five. "I've got 30 Tem left over. For women, who are worst affected by unemployment, and don't have kafeneia [coffeehouses] to go to like men, it's like belonging to a hugely supportive association." Greece's deepening economic crisis has brought new users. With ever more families plunging into poverty and despair, shops, cafes, factories and businesses have also resorted to the system under which goods and services – everything from yoga sessions to healthcare, babysitting to computer support – are traded in lieu of credits. "For many it plays a double role of supplementing lost income and creating a protective web at this particularly difficult moment in their lives," says Yiannis Grigoriou, a UK-educated sociologist among the network's founders. "The older generation in this country can still remember when bartering was commonplace. In villages you'd exchange milk and goat's cheese for meat and flour." Other grassroots initiatives have appeared across Greece. Increasingly bereft of social support, or a welfare state able to meet the needs of a growing number of destitute and hungry, locals have set up similar trading networks in the suburbs of Athens, the island of Corfu, the town of Patras and northern Katerini. The Telegraph article is not the only mainstream post dealing with these systems. 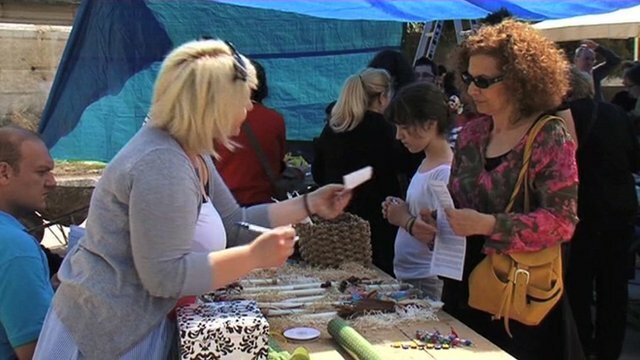 Recently there was a BBC profile of Greek alternative barter/currency systems. Like this Telegraph article, the BBC article mentioned nothing significant about the option of gold and silver. The issue of tax reporting is brought into the article – and an insinuation is made that people are dodging taxes by using these systems. But so far as we can tell, such systems need central bookkeeping, which is one reason why we figure the United Nations has been a supporter of them. We've written a series of articles about UN promotion of such systems. Gold and silver can trade tax-free with proper precautions. We're not recommending tax avoidance, merely pointing out how commerce works. Gold and silver are far harder to track for personal usage than barter/currency systems that use a centralized bookkeeping system. Are Greeks turning to gold and silver as well, as those in Zimbabwe have done once the economy collapsed? You wouldn't know it from this article but we would bet gold and silver are finding their place alongside such barter/currency systems. Conclusion: The BBC and Telegraph are just not mentioning it ... Wonder why?